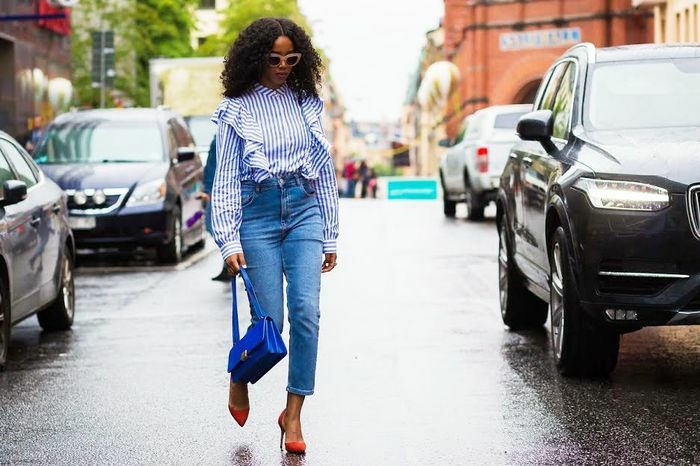 Fashion month is fast approaching, and you know what that means—we're about to have an endless slew of street style inspiration. We'll also soon know what all the major must-have items are based off what It girls are wearing on the streets between shows. Luckily we're already starting to get a taste of it from all the looks from Copenhagen's Fashion Week. One of the coolest items we've spotted so far might surprise you, however—a striped top from H&M. This isn't your average striped top, however. Style du Monde captured a seriously fashionable girl styling this artfully ruffled piece with high-waisted denim and killer bright-red pumps. The ruffle detail really takes the blouse to the next level, adding another dimension of craftsmanship that makes it look way more expensive than it really is. While her particular top isn't available, we took the liberty of rounding up similar striped and ruffled tops from the fast fashion retailer. Keep scrolling to get the look! Which ruffled top is your favorite? Share your styling tips in the comments below!